For generations, dentures have helped people avoid the dire consequences of total teeth loss. Now, implant technology is making them even better. Composed of life-like prosthetic teeth fixed within a plastic or resin gum-colored base, dentures are manufactured to fit an individual patient’s mouth for maximum fit, comfort and performance. But dentures also have a critical drawback—they can’t stop bone loss in the jaw. Bone is constantly regenerating as older cells dissolve and then are replaced by newer cells. In the jawbone, the forces generated when we chew travel through the teeth to the bone and help stimulate this new cell growth. When teeth are missing, though, the bone doesn’t receive this stimulus and may not regenerate at a healthy rate, resulting in gradual bone loss. Dentures can’t transmit this chewing stimulus to the bone. In fact, the pressure they produce as they rest on top of the gums may actually accelerate bone loss. Over time then, a denture’s once secure and comfortable fit becomes loose. In the past, most patients with loose dentures have had them relined with new dental material to improve fit, or have new dentures created to conform to the changed contours of the jaws. But implant technology now offers another alternative. Implants are in essence a tooth root replacement. Dentists surgically implant a titanium metal post directly into the jawbone that naturally attracts bone cells to grow and adhere to it over time (a process called osseointegration). This not only creates a secure and lasting hold, it can also stop or even reverse bone loss. Most people know implants as single tooth replacements with a porcelain crown attached to the titanium post. But a few strategically placed implants can also support either removable or fixed dentures. 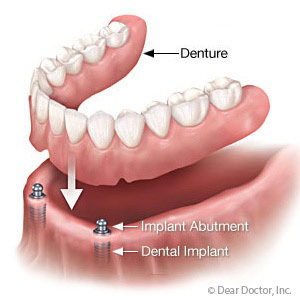 Removable dentures (also called overdentures) usually need only 3 or 4 implants on the top jaw and 2 on the bottom jaw for support through built-in connectors in the dentures that attach to the implants. A fixed bridge may require 4-6 implants to which they are permanently attached. There are pros and cons for each of these options and they’re both more expensive than traditional dentures. In the long run, though, implant-supported dentures could be more beneficial for your bone health and hold their fit longer. If you would like more information on implant-supported dental work, please contact us or schedule an appointment for a consultation.